Rosemary Sutcliff was one of my favourite authors when I was a child and I particularly loved Brother Dusty Feet, about a boy who joined a group of strolling players set in Elizabethan England. 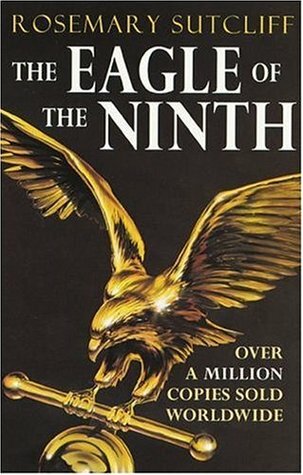 I bought The Eagle of the Ninth in a library book sale several years ago because I remembered my love of Brother Dusty Feet and had meant to read it well before now. I got round to it this month and thoroughly enjoyed it, so it’s one of my TBRs for Bev’s Mount TBR Reading challenge. The first half of the book tells of how Marcus Flavius Aquila, a young Roman officer arrived in Britain as a centurion and was injured in a battle and then, unfit for duty, was discharged. Some years earlier, sometime in 117 AD, the Ninth Hispana Legion, led by his father had marched north from its base at Eburacum (York) into the mists of Northern Britain to deal with a rising among the Caledonian tribes and was never heard of again – their Eagle Standard was also lost. To the Outland tribes it must seem that they have captured the god of the Legion: and so they carry it home in triumph, with many torches and perhaps the sacrifice of a black ram, and house it in the temple of their own god to make the young men strong in war and help the grain to ripen. He disguises himself as a Greek occulist, and with his freed ex-slave, Esca, travels beyond Hadrian’s Wall. The rest of the book is about their search through the wild borderlands north of the Wall in what was then the province of Valentia and over the Northern Wall (the Antonine Wall), into Caledonia, along the shores of Loch Lomond to the base of Ben Cruachan overlooking Loch Awe. Rosemary Sutcliff was a wonderful storyteller, bringing Roman Britain to life in beautifully descriptive prose, so vivid that it’s easy to picture the scenery and the characters. It’s a powerful adventure story, full of detail particularly about Marcus and Esca – their friendship and courage in the face of danger and hardship. There is plenty of suspense as they fight their way through mountains and bogs, pursued by the hostile tribes. It’s also a novel about honour, duty and love. She based The Eagle of the Ninth on two facts. First, the disappearance of the Ninth Legion. And second, the discovery of a cast bronze figure of an eagle found in the Basilica of the Roman town of Calleva, near Silchester. The eagle’s original wings are missing and its origin is unknown. Although it was not a legionary eagle, it inspired Rosemary Sutcliff to write her book. There is a map at the front of the book showing the route Marcus and Esca took and some of the places described, including Trinomontium (Melrose), Luguvalium (Carlisle), Segedunum (Wallsend) and Borcovicus on Hadrian’s Wall (Housesteads Roman Fort) and the Northern Wall. I loved all the detail of the mix of peoples living in Britain, their religious beliefs and ceremonies and their social and cultural background. It’s described as a children’s/YA book but I think it’s suitable for adults too – the writing style is certainly not simplistic and the vocabulary is extensive. It is quite simply a gem of a book. At the age of two she contracted Still’s disease and spent most of her life in a wheelchair. At 14 she left school having made little progress in anything except reading and went to an art school, specialising in miniature painting, becoming a member of the Royal Society of Miniature Painters just after the Second World War. She wrote very many books, both fiction and non-fiction, and won several awards. I didn’t realise that Rosemary Sutcliff had had such a difficult life. Not all that old when she died too, I notice. I’ve seen the film of this book which I really enjoyed but I suspect the book is even better so will try to grab myself a copy and read it this year. This does sound like a terrific mix of history and mystery, Margaret. That combination really appeals to me, especially in the hands of a skilled writer. I’m glad you enjoyed it as well as you’d hoped you would. I somehow missed out on Rosemary Sutcliff as a child, which is a shame as I’m sure I would have loved her books. I’m hoping to try this one soon, so I’m pleased to hear you enjoyed it and that you think it’s suitable for adults! I loved this one too and agree that her books are suitable for adults as well as children. sounds good, so glad you enjoyed it. I am so pleased to hear you enjoyed this – I want to read it even more now! I have such memories of this book as a child even though I remember little of the actual story. I only know that I loved it. One to revisit I think.